This image captured on July 23, 2012, at 12:24 a.m. EDT, shows a coronal mass ejection that left the sun at the unusually fast speeds of over 1,800 miles per second. This image was captured by one of NASA's twin STEREO sun-watching spacecraft. Released March 18, 2014. When two blasts of super-hot plasma from the sun slammed into each other in 2012, they forged a "perfect storm" of space weather so intense, it was stronger than the most powerful solar eruption in the history of the space age, scientists say. A new study of the solar superstorm, which occurred on July 22 and 23, 2012, as formed by the interactions of two individual coronal mass ejections (CMEs), is providing insights into space weather events with the potential to disrupt life on Earth. 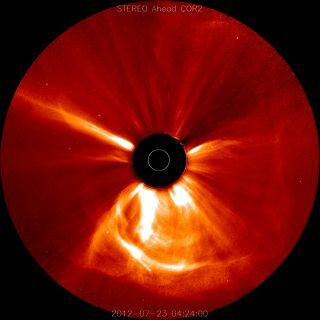 You can see a video of the perfect solar storm here, as seen by NASA's twin STEREO spacecraft. "An extreme space weather storm is rare by definition, but may not be as rare as we imagine," Liu told Space.com via email. Two coronal mass ejections collided near the sun, creating a powerful 'perfect storm' of charged particles that could have had a dramatic effect on Earth. The solar storms occurred on July 22 and 23 in 2012. During the July 2012 solar superstorm, the sun hurled not two shots into space in rapid succession, following a third earlier emission. The eruptions, which occurred on the far side of the sun and didn't pass near Earth, interacted with one another to form what Liu called a perfect storm. A coronal mass ejection occurs when the sun blasts a huge cloud of charged plasma into space. The energy and speed of a CME depends on the active region, or sunspot, from which it originates. By the time a CME reaches Earth's orbit, its speed has been further influenced by its trip through space. In order for two CMEs to create an extreme space weather storm, they must occur in quick succession, interacting with one another as close to the sun as possible. These powerful ejections expand as they travel through space, but their colliding magnetic fields can inhibit their growth. "For two CMEs to react, they don't have to travel along exactly the same path," Liu said. "As long as the difference between their paths is smaller than their width, they are likely to interact." To make a perfect storm, a third large CME must have occurred earlier to minimize the effects of the solar wind on the later pair; the interacting CME pair essentially drafts the earlier eruption much as a race car driver drafts a vehicle i, researchers said. With the path cleared before them, the combined CME would travel toward Earth much quicker than the average time of three to four days. The 2012 event was one of the fastest-traveling solar storms measured at the time, zipping through space at approximately 5 million mph (8 million km/h). Fast storms can generate a shock in interplanetary space, producing energetic particles and radio bursts. The electric field formed by Earth-directed CMEs and superstorms interacts with our planet's magnetic field. The product of the interaction determines the strength of the storm, with a larger product resulting in a more intense event. Collisions between two CMEs are common farther from the sun, where expanding ejections allow for interactions that aren't possible when the plasma is more compressed while closer to the sun. And powerful storms can still occur even when the ejections aren't rapid-fire. As the first CME clears the path for plasma traveling in its wake, each subsequent ejection is able to travel faster, potentially catching up to the preceding one, though not creating perfect storms. The new study was published online today (March 18) in the journal Nature Communications. Charged material streaming from the sun can have devastating effects when it collides with Earth. In small doses, particles from the sun interacting with the planet's magnetic field can create beautiful auroral displays, which are also known as the northern and southern lights. In large doses, the results are not nearly as pretty. The most powerful recorded geomagnetic storm occurred in 1859. Known as the Carrington event, the solar storm caused aurorae to shine brightly over the Rocky Mountains and be seen in Cuba and Hawaii. Some telegraph machines continued to send and receive messages despite being disconnected from their power source, and several operators reported receiving electric shocks. On March 13, 1989, a powerful magnetic storm connected with Earth in the strongest recorded single storm of the space age. Primed by a disturbance in the solar wind, the space weather caused the collapse of Canada's Hydro-Quebec power grid and the loss of electricity for millions of people for up to nine hours. This event was only one-third as powerful as the Carrington event. With the enormous electric infrastructure spanning the world today, a storm as powerful as the Carrington event would like have devastating effects if it struck now. The cost of extreme space weather can reach up to $1 trillion, with a potential recovery time of four to 10 years when cascading socioeconomic effects are considered, according to the National Research Council Space Studies Board in the United States. Single storms can also wreak havoc with satellites, GPS systems, and power grids. The devastating potential of perfect solar storms underscores the need to study and better understand them, along with the less powerful single spawns that drive them, scientists say.